TWELVE Is for our very final edit days “designing” the final look and sound of the film. We got into the groove with a retro vibe and a chique 1960s palette from our amazing graphic design team at Belle & Wissell! ELEVEN Is for the reviews we currently have on IMDB about the film! Add yours over the holidays and help us reach more audiences in 2014! EIGHT Is for the nervous level out of 10 experienced by director Karen Whitehead when told to stand in front of the camera instead of her usual place behind it, for the SIFF TV interview! SEVEN Is for the number of cool stories Beatles secretary, Freda Kelly shared with director Karen Whitehead and guests at Hot Springs Documentary Film Festival after the screening of the film “Good Ol Freda” about her experiences with the Fab Four. FIVE Is for the number of indie film festivals we screened the film at and the enthusiastic audiences we connected with during 2013. Shout out thanks for supporting the film to #SIFF (Seattle International Film Festival), Tacoma Film Festival, Hot Springs Documentary Film Festival, Gig Harbor Film Festival and #Tallgrass Film Festival. #indiefilmrocks! FOUR Is for the best questions asked at our Q & A’s after our festival screenings! (1) As both the director and editor are female, how did that frame the sensibility of how you told this story? (2) Why did you pursue this story about Jini’s artistry? (3) What can I do to help the film? (4) The film plays like a cool rockumentary, not a biopic about a 96 year old photographer! What were your influences and inspirations for this approach? THREE Is for great images of Jini at our sold out film festival screenings, treating audiences at SIFF, Tacoma & Gig Harbor to the magic of Jini, at 96! TWO Is for the inspired blogs by talented production team interns, Annie Schweikert and Jon DeMaio. 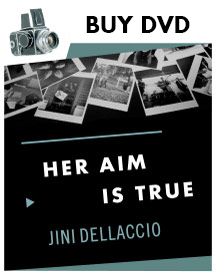 If you did not read them – just click on their names to see why the younger generation want to know about Jini Dellaccio and her contribution to photography! ONE Is for outreach by each and everyone! The film is for you, it is yours now. Beyond festivals, in 2014 we want to support arts advocacy and further conversations about pursuing creativity, inspired by Jini’s little known story and artistry. It only takes one click, one comment, one recommendation to be part of our outreach team and help us fulfill our ultimate goal. Spread the word : Her Aim Is True is going global in 2014!